Luffa sponge products are readily available in the cosmetic and bath section of department stores, discount stores, pharmacies, and specialty shops. The popularity of luffa for personal hygiene products is due to the gentle exfoliating effect the fibers have on the skin. Many environmentally conscious consumers appreciate that luffa products are biodegradable, natural, and a renewable resource. In many other countries luffa is also used to make household cleaning products for scrubbing pots, pans, barbecue grills, tires, and many other surfaces that are not harmed by the abrasive fibers. The tough fibers can also be processed into industrial products such as filters, insulation, and packing materials. Craft shows often exhibit dolls, hats, toys, and other decorative items made from luffa sponges. Presently, luffa sponges are imported from many countries including China, El Salvador, Korea, Taiwan, Guatemala, Columbia, and Venezuela. 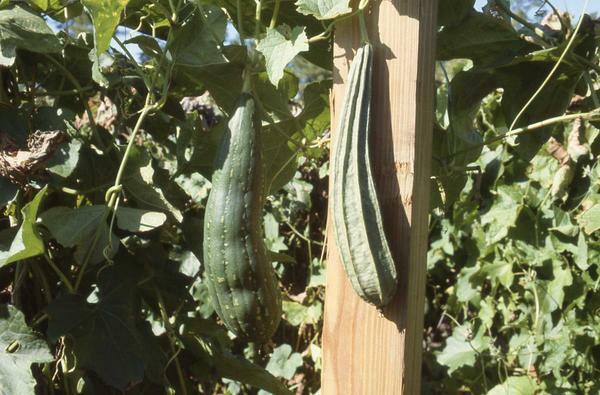 Luffa are also grown in home gardens throughout much of the United States. During the early 1990s, research in Missouri and North Carolina demonstrated that commercial production of luffa sponge gourds was also feasible in the United States. A rising demand for luffa products, a desire for new, high-value crops, and wholesale prices of .10 to .40 per sponge stimulated interest in producing large acreages of luffa sponge gourds in the Southeastern United States, particularly in North Carolina and Florida. Luffa sponges are the fibrous interiors of the fruits of the luffa sponge gourd plant (Luffa aegyptiaca Mill.). A tropical member of the Cucurbitaceae, the luffa sponge gourd plant is an annual vine with tendrils and large, cylindrical fruit that are edible when young. Most luffa cultigens are monoecious; male flowers develop in a cluster, whereas female flowers develop singly or in association with male flowers. The lower nodes of luffa usually bear only male flowers, followed by nodes having both male and female flowers, which are followed by solitary female flowers at the uppermost nodes. The mature, dry fruit consists of a hard shell surrounding a stiff, dense network of cellulose fibers, adapted for support and dispersal of hundreds of flat, smooth black seeds. 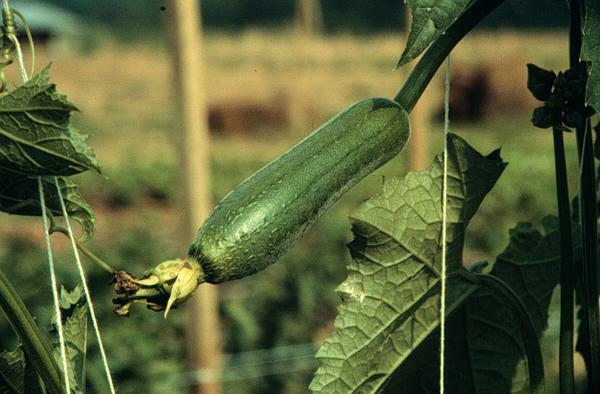 Luffa is closely related to cucumber and modified cultural practices for trellised cucumber production can be used. One must keep in mind, however, that luffa is a tropical plant which requires a long growing season and warm temperatures. Presently, one of the most difficult aspects of entering into commercial luffa sponge gourd production is obtaining large volumes of high quality seed. 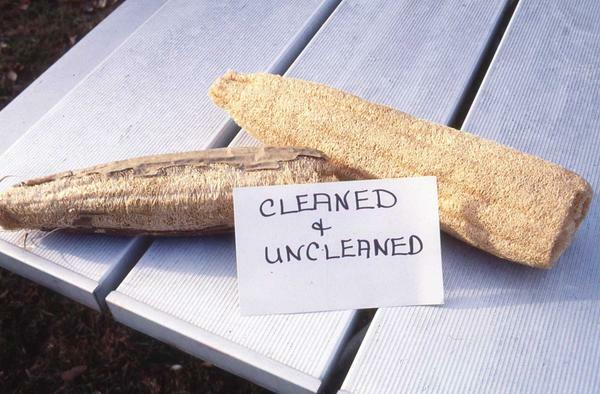 Much of the luffa seed sold for home gardens produces small, low-quality sponges with weak fibers. Once you have produced luffa sponges of the quality you desire, save your own seed. Keep in mind that luffa gourds cross-pollinate easily. To maintain trueness-to-type year after year, do not grow different luffa cultigens within 1,500 feet of each other. Luffa seed germination is often slow and sporadic. To obtain good plant stands, luffa gourds should be produced from transplants. Soak seed in warm water for 24 hours prior to seeding. Sow seeds, two to three per cell, in flats. Thin to one plant per cell after the first true leaves appear. Grow for four to six weeks in a greenhouse at about 65-70°F. Luffa should be transplanted outdoors after all danger of frost is past. Luffa gourds require a well-drained soil in a location where they will have full sun and good air circulation. Conduct a soil test prior to planting and follow lime and fertilizer recommendations for cucumbers. Two or three times during the growing season add 20-25 pounds nitrogen per acre as a sidedress or through the drip-irrigation system. To speed growth in the spring in cooler climates, luffa gourds may be grown on raised beds with black polyethylene mulch. Irrigation is required with drip-irrigation being the preferred method. 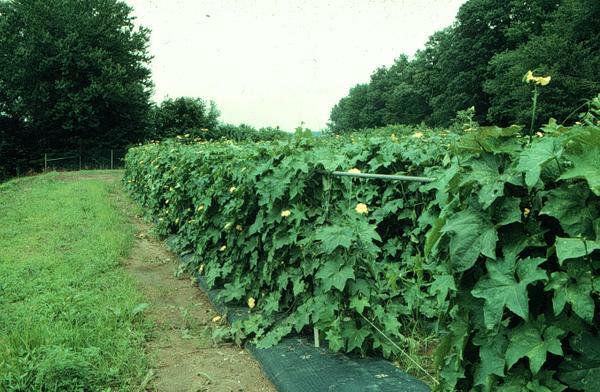 Luffa sponge gourds benefit greatly from being grown on a trellis system. If luffa gourds contact the ground, fruit rot, discolored sponges, and misshaped gourds are usually the result. A vertical trellis, similar in design to ones used for trellised cucumbers and pole beans, is most commonly used. It must, however, be VERY STURDY! To support the weight of mature gourds, 4" x 4" posts set ten feet apart are recommended. The top horizontal support should be a heavy gauge wire or cable. Several other wires can be run horizontally between the top wire and the ground. To help train the vines to the trellis, string can be run between the top and bottom wires in a V-pattern, as for pole beans, or a nylon mesh can be used. Space rows five or more feet apart to accommodate equipment. In-row spacing of 12-18 inches has produced the highest yields of marketable sponges. The plants need to be hand trained weekly until they reach the top wire. Try to keep all fruit off the ground and away from the trellis wires. Prune plants by removing the first four lateral shoots (from the soil line upwards). As for all cucurbits, luffa gourds need to be pollinated. Position one or two hives of bees per acre nearby when the plants are in full bloom to ensure adequate pollination. Pest control on any minor crop is difficult because there are few pesticides cleared for use. Fortunately, few pests have been encountered on luffa in North Carolina. Cucumber beetles, spider mites, mildews, and viruses have been minor problems. Practice crop rotation, prune as described above, and use drip-irrigation to reduce the chances of having disease problems. If pesticides must be used, be sure that 'gourds' are listed on the product label. In autumn, mature gourds will begin to turn brown and dry. Check plants frequently and remove any dried gourds. These will be brown, feel light and dry, and rattle with loose seeds when shaken. After the first killing frost, go through the field again and remove any more dried gourds. Remaining gourds can be allowed to continue drying in the field or be brought inside to dry in a warm, well-ventilated area. Do not let dried gourds hang in wet weather for any length of time or the sponges will discolor. Store dried gourds in a dry, well ventilated area on racks or screens or suspended in mesh bags. If gourds are mature when dried, the skins will be easy to remove from the sponges. Simply soak in warm water, from five to twenty minutes, until the sponges slip out of the skins. When the sponges are free from the skin and excess pulp, a 10% sodium hypochlorite bleach solution (Clorox) can be used as the final rinse to lighten the sponges. Another harvesting/cleaning method that can be used, particularly in areas with a long growing season, is to remove mature gourds (dark green) when they first start to yellow and the skin begins to release from the sponge. When the gourd is gently squeezed, the skin should kind of 'pop' indicating that it is starting to loosen from the sponge. At this stage, the blossom end cap can be broken off, and a vascular bundle can be pulled up the side of the gourd like a zipper. The sponge will pop out and be very wet and white. Quickly rinse the sponge in water to prevent the plant juices from oxidizing on the sponge. Allow sponges to dry thoroughly on racks or suspended from hooks or lines. These sponges do not need to be soaked or bleached. Harvesting this way, however, does require that you check the plants every day or two as the gourds mature. Seeds can be removed before or after the skins are removed. If the skins are intact, break the cap off the distal (bloom) end of the dried gourd and shake the gourd or beat two gourds together. Depending on the final intended use for the sponge, seed removal can be expedited by cutting the sponge perpendicular to the long axis (as for bath sponges) or along the long axis (to make mitts and pads). Save seeds from good sponges for the next growing season. Dried luffa gourd with and without the "skin"
The highest price per sponge will be obtained through direct-marketing. With a little creative labeling and advertising, luffa sponges should sell well at farmers' markets, roadside stands, and tail-gate markets. Depending on the size of the sponge and the amount of 'value-added' to it, a sponge should sell from $1-5. If a grower has several thousand sponges to sell, he/she might consider selling them to local health food stores, specialty shops dealing with environmentally friendly products, gift basket shops, and other independently owned stores. Again, creative marketing is the key. If a grower is really serious about luffa sponge gourd production and has demonstrated the ability to reliably produce high volumes of high-quality sponges, there are some large buyers that may be interested in talking to him/her. Study luffa products currently on the market. If the quality of your luffa is similar to a commercially available product, you can contact that company directly and offer to submit a sample. A serious, business-like approach is required to "get your foot in the door". Several small, local companies have also expressed interest in buying small wholesale volumes of quality luffa. Check out local specialty shops to find their products. Luffa sponge gourds are a very minor crop in this country. Although they have the potential to be quite profitable, bringing up to .40 per sponge wholesale and $5 per sponge retail, with expected yields of over 20,000 sponge per acre, many production problems may be encountered. The lack of registered fungicides and insecticides may be a limiting factor, as may be the high labor requirement for training the plants and cleaning the sponges. Currently, high-quality, imported sponges are plentiful and inexpensive. Productions costs must be kept very low to be competitive. Luffa may, however, be the ideal supplemental crop for some ambitious growers with good marketing skills. Presently, there are growers with small acreages of luffa scattered across the Southeast. Davis, J.M. 1994. Luffa sponge gourd production practices for temperate climates. HortScience 29(4):263-266.